Long before the civilization of mankind, extremely fierce yet primitive life forms roamed the earth and battled for supremacy. Thousands of years ago, the final battle took place. One side, after using all its strength, perished while the other was sent to and sealed off in a different dimension. The tale of this battle was preserved in legend after mankind began to populate the earth and the two forces, known respectively as the gods of the Dragon and the demons of Darkness, came to be revered by certain clans among the people. By the summer of AD 1988, even this ancient great tale had almost been completely forgotten. However, one very evil being appeared and, with the help of his followers, began to build an Empire of Darkness. That being was Jaquio- a member of the Demon clan who plotted to bring the demons of Darkness back to the earth. He secretly schemed to steal and bring together, for the first time in aeons, the two "Statues of Light and Darkness" said to contain great magical power. This would open the passageway between the dimensions. There was, however, one man who would stop at nothing to foil Jaquio's evil plans - head of the Dragon clan, Ken Hayabusa. After entrusting the Dragon Sword, an heirloom of the family and clan so old that no one knew when it had been made, to his son Ryu, Ken left for the fateful battle. Unfortunately, Ken was defeated by a powerful warrior and the Statue he was protecting fell into the hands of Jaquio. After hearing of his father's death, Ryu took the Dragon Sword and went to America. Aided by a female CIA spy, Irene, Ryu stealthily infiltrated Jaquio's secret hideout. Watching this duel from afar was the real evil, the head of the Demon clan, the Evil Lord himself, Ashtar. As it turned out, Jaquio was nothing more than a pawn of this greater power. Ashtar hid himself in the darkness, assessing his enemy. His eyes shined and he licked his lips. He had only to wait for his enemy. While pursuing her investigation into the movements of the mysterious Ashtar, Irene suddenly disappeared. A super-secret CIA special force platoon then became pinned down in front of some old ruins that were believed to house Ashtar's headquarters. The situation looked desperate. At this point, Ashtar, who himself had actually seen the birth of the Dragon Sword and knew of its potentially awesome powers, emerged again from the depths of his dark realm. Ryu, who knew nothing of all this, was in grave danger as Ashtar worked his black magic to destroy him. ... in this, the final chapter of Ninja Gaiden. --From the NES Ninja Gaiden 3 instruction manual. 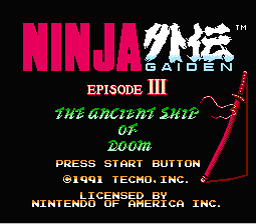 Play Ninja Gaiden 3 Now! Jump, slash, climb walls, hang from pipes as you sidescroll! To use Ninja Magic press UP+B. You need enough Ninja Fuel though. You can lengthen your slash with power-ups. You can now leap onto the ledges you climb easily by pushing towards it and hitting the jump button. Press UP and START to restore HP when you get hit by enemy.